Photo: JDC The JDC delivers aid to needy Ukrainian Jews during the current crisis. DALLAS — Stanley A. Rabin, the newly elected president of the American Jewish Joint Distribution Committee, said he will never shirk his responsibility to help Jews living in turbulent areas of the globe. On Dec. 14, Rabin, 77, was elected the 17th president of the JDC — arguably the world’s leading Jewish humanitarian assistance organization. As president, he shoulders much of the responsibility for actions taken by the organization. He is the critical link in the chain of command between JDC’s CEO and its board — ensuring the CEO is following the wishes of the board. It’s an unpaid volunteer job that is both stressful and necessary, Rabin said. He can serve up to four years — four one-year terms — in this post. Born to parents who fled violent riots targeting Jews in Eastern Europe, Rabin is a first-generation American. He said he feels deeply connected to the JDC’s Jewish humanitarian aid program — which stretches across 70 countries. Daunting but necessary, JDC’s mission is to save lives and overcome challenges facing the Jewish people and Israel, Rabin said. The question is, who knows where the next challenge will arise? Rabin’s immediate predecessor is previous JDC president Penny Blumenstein, who said Sunday that this job carries an undeniable, momentous responsibility. “A lot of people say ‘the buck stops here,’ but with the JDC president it really does,” she said. Rabin has a very distinct vision about how the JDC should be led and is the best possible person to replace Blumenstein as president, she said. Blumenstein said Rabin will work closely with Alan H. Gill, chief executive officer of the JDC, on a daily basis and is responsible for making sure JDC funds are being used wisely. Rabin, meanwhile, said he remains watchful of the very high poverty level that makes JDC a literal lifeline for many areas of the world. Reaching out to the next generation of leaders goes a long way toward helping fight such problems, Rabin said. “Engaging young Jews is a challenge but we believe they do want to be engaged and we have had a significant amount of success with that,” he said. Rabin and his wife, Barbara, have two children and five grandchildren. Rabin said he is keenly aware of the disconnect that can take place between generations of people — and that it is important the younger generations know what is happening with the Jewish world on a global scale. On the subject of leadership, CEO Alan Gill said the JDC board is already filled with extraordinary leaders. Rabin, he said, brings something else to the table — that certain intangible something that is the hallmark of visionary leadership. Having Rabin as president can only enhance the organization’s ability to carry out its critical work, Gill said. Daniel J. Prescott, board chair of the Jewish Federation of Greater Dallas, agreed wholeheartedly. Rabin said it was good to get such great feedback. Rabin said one major emphasis of his as JDC president will always be the struggle against Jewish poverty in the world — especially outside the United States and in Europe. JDC will continue to ensure that Jews are able to live in a safe and secure environment and that people have a sense of dignity and accomplishment, Rabin added. He believes helping people and communities become more self-sustaining will go hand in hand with helping develop the future Jewish leadership. Rabin is a past chairman of the board of the Metroplex-based Commercial Metals Company. He served as chief executive officer there for 28 years. He is a longstanding member of the JDC’s board of directors, serving since 2007 most recently as board treasurer. Additionally, he is immediate past chairman of the board of Texas Health Presbyterian Hospital of Dallas. He is a member of the boards of the Dallas Holocaust Museum/Center for Education & Tolerance, the United Way Foundation of Metropolitan Dallas, the Dallas Symphony Orchestra, Temple Emanu-El of Dallas, and the Dallas Jewish Community Foundation. Rabin is a former member of the board of Hebrew Union College-Jewish Institute of Religion and the board of governors of the American Jewish Committee. 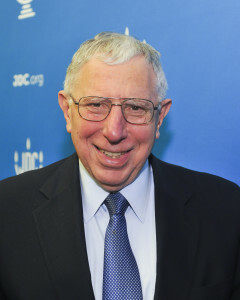 He is a past president of the Jewish Family Service, the Jewish Federation of Greater Dallas and Temple Emanu-El. Chabads throughout the Dallas-Fort Worth Metroplex are celebrating Shnat Hakhel, which means the “year of gathering,” with Shabbat dinners and other programming. During the era of the First and Second Temple, all Jews — from infants to the elderly and everyone in between — gathered there every seven years to hear the reading of the Torah by the King of Israel and be inspired to walk in the ways of God. This ceremony originally took place at the Temple in Jerusalem during Sukkot following a Shmita year. Since 5775 was the most recent Shmita year, there currently is a yearlong opportunity (during this year, 5776) for Jews to gather together and observe Hakhel. The Biblical mitzvah of Hakhel was in effect only when all the Jewish people resided in Israel. The late Rabbi Menachem Mendel Schneerson, the Lubavitcher Rebbe, urged all Jews to conduct small and large Hakhel gatherings in synagogues and private homes — thereby fostering unity and increasing Torah learning, mitzvah observance and charity. Rabbi Moshe Naparstek of Chabad of Dallas said Hakhel is the only event that has ever required the attendance of every single Jew. “The first time it happened, the Jewish people were at Mount Sinai and every member was there,” Rabbi Naparstek said. He explained that Jews got together every seventh year to relive the Mount Sinai experience. Rabbi Block said the gathering is a global community event and Chabads of Dallas, Frisco and Plano are holding three dinners to celebrate it. Additional events are planned throughout the year. Rabbi Block added that the gathering doesn’t have to be observed in only large groups. It also can take place with individuals or together with family. The Shmita, incidentally, is the seventh year of the seven-year agricultural cycle mandated by the Torah for the Land of Israel. It still is observed in contemporary Judaism. Chapter 25 of the Book of Leviticus promises bountiful harvests to those who observe the Shmita, and describes its observance as a test of religious faith. Rabbi Block said the principle of gathering and unity inspired by Hakhel is what strengthens the faith in all Jews. Rabbi Block said he discussed Hakhel with his congregation during his Yom Kippur sermon and members were enthusiastic. Rabbi Naparstek agreed that the point of Hakhel is to increase Torah observance and to foster an environment that would make God proud. There is no charge for this dinner, which is generously being sponsored by Ed and Linda Matisoff, Stuart and Naomi Mishler and Drs. Velvel Kantor and Mordechai Segal. For the first time ever, Rabbis Menachem Block and Yehudah Horowitz and Rebbetzins Rivkie Block and Esther Horowitz will each present a different layer of Torah interpretation, on the same Torah topic as part of a panel. RSVP by Feb. 4 at 972-596-8270 or connect@chabadplano.org. Rabbi Mendel and Mushkie Kesselman will welcome you to a Hakhel celebration that includes good food, good company and plenty of Shabbat spirit. This is a great opportunity to meet the Frisco community. There will be adult and kids’ programs. Cost is $18 for adults and $12 for children ages 3-15. RSVP at http://bit.ly/23qYOGA or call 214-460-7773. Comfort Suites Hotel, 9700 Dallas Pkwy. Kabbalat Shabbat services followed by an Israel-themed dinner and Hakhel program. Cost is $25 for adults and $15 for children. RSVP by Feb. 8 to www.chabadofdallas.com/shabbat or 972-818-0770. One hour of Jewish unity, Torah study and inspiration will be streamed live in a simultaneous broadcast to hundreds of communities around the globe. The broadcast will feature Mrs. Rachel Frenkel, Prime Minister Benjamin Netanyahu, Rabbi Yisrael Meir Lau, Rabbi Lord Jonathan Sacks and Rabbi Yitzchak Schochet. The link to watch this event online has not been announced yet. 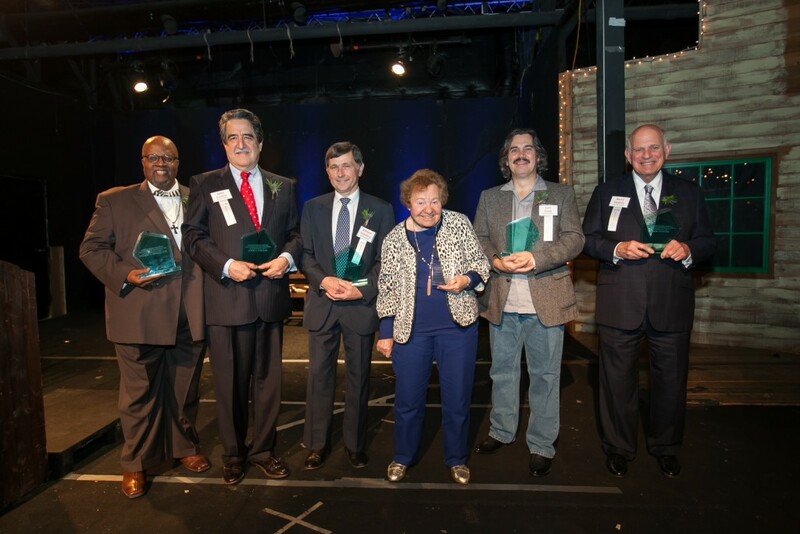 On Jan, 6, an enthusiastic crowd of 300 joined Southwest Jewish Congress at Eddie Deen’s Ranch in downtown Dallas to honor six deserving men who were chosen to receive the prestigious 2016 Stan Golden Men of Action Award. It was “an evening of heart, kindness and truth” according to one of the attendees. Despite the rain, the ambience in the “old Texas-style” ranch was warm and festive. Dignitaries attended from such organizations as the Dallas Summer Musicals, Dallas Arboretum, Sammons Center for the Arts, American Indian Heritage Day of Texas, Thanks- Giving Foundation, The Mexico Institute and Temple Shalom, as well as representatives from the Boy Scouts of America. The award is named in honor of Stan Golden, a quintessential Man of Action. It recognizes men from diverse disciplines and backgrounds in the DFW area who have distinguished themselves in pursuit of positive social change, and who have made an impact on our communities as both role models and trailblazers. The first presentation was a “Lifetime Achievement” award presented to the event’s namesake — Stan Golden. His daughter, U.S. District Judge Barbara M.G. Lynn, received the award on his behalf. Judge Lynn told the audience about her father’s history and many volunteer efforts and showed a brief video greeting from Stan, who was unable to attend. Carl Crow — Mission coordinator, North Texas Mankind Project, volunteer trainer. John Cuellar — Successful restaurateur of El Corazon restaurant in Oak Cliff, attorney, dedicated community volunteer and supporter. Barry Epstein — Inventor, community leader and designer of advanced systems for the hearing-impaired. Warren (Chip) Fagadau, M.D. — Ophthalmologist, community leader and political activist. Richard Hutchins — CPA; Boy Scout leader; Eagle Scout adviser; commissioner, Northern Trail District. Rev. Claude Maples — Pastor emeritus, Romine Avenue Christian Church, community organizer. The Stan Golden Men of Action Awards evening joins the Audrey Kaplan Inspiring Women of the Southwest Awards Celebration and the prestigious Flame of Honor Awards dinner as a new signature event of the Southwest Jewish Congress. Dr. Joel Roffman rode in the MS150 last May shortly after completing an aggressive course of chemotherapy to triumph over lymphoma. Dr. Joel Roffman will be on hand at Shearith Israel at 10:30 a.m. Sunday, Jan. 31 to discuss his book, Making Every Day Count. Roffman, a cardiologist and member of both Shearith and Kehillat Chaverim, will share his journey of battling metastatic lymphoma beginning in the fall of 2014. 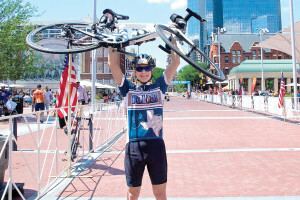 Soon after completing four months of intensive treatment, Dr. Roffman rode in his 18th MS150, a two-day cycling event in which he rasied more than $14,000 for the Multiple Sclerosis Society. It is an inspiring story not to be missed. A Q&A with Rabbi William Gershon and Dr. Roffman will follow the presentation. 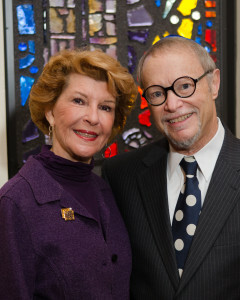 The Sisterhood of Congregation Beth Torah has chosen Evelyn and Paul Utay as its Torah Fund Honorees for 2016. The couple will be recognized at the annual Torah Fund Brunch, to begin at noon Sunday, Feb. 28, in Addison Crowne Plaza Hotel, 14315 Midway Road. The Utays originated in two very different places: Paul is a native Dallasite, while Evelyn was born in Cologne, Germany. Her parents came to America in 1938 and settled in San Antonio. Paul always loved music, and Beth Torah’s tradition of free-spirited singing brought him and his family there in 1983. He was the father of three children when his wife, Janie Leibs Utay, passed away in 1999; he now has three grandchildren as well. Evelyn was also married with three children when her husband Les Wilk’s work in clothing design and manufacturing sparked the family move to the Dallas area. She was widowed in 1995 and now has six grandchildren and two great-grandchildren. Evelyn’s mother-in-law and Paul’s mother were sisters, so the Utays call themselves cousins of a sort who saw each other sporadically over the years, mainly at major events that brought their two families together. Paul had his career as an electrical engineer; Evelyn always worked in her husband’s business, and after his death continued in the industry, both at the Dallas Apparel Market and taking trunk shows across the country. Both agree that it was a family tragedy, the death of Paul’s brother, Reuben Utay, that led to their marriage. His sister, Pearl Friedman, helped the two “discover each other” at a memorial service in Dallas. They had their first date in August 2002, and their wedding was the following April. Evelyn quips today, “I knew his mother. And if you know a guy’s mother, you know the guy!” After they married, she continued working part-time, retiring altogether in 2010. Since then, the Utays have traveled together, even going to Germany to see the house in which Evelyn was born. Evelyn never had much time for organization work before, but after marriage, she quickly became involved in Beth Torah activities. She now serves both Sisterhood and the Chai Lights senior group in many capacities, and has been on the synagogue board as secretary and presently is co-chair of Adult Education. Paul, now semi-retired, volunteers in the religious school, and has contributed to the congregation through music: he is a regular Torah reader and has served over the years as one of Beth Torah’s member cantors during the High Holidays. Since joining in 1983, he has also tutored many to Beth Torah’s students to prepare them for their b’nai mitzvah. And the music combo he leads, “Jazz, After All,” which plays at area arts venues and senior residences, has entertained at many synagogue events — including a number of past Torah Fund brunches! This annual brunch is a Beth Torah tradition that began in 1994, with Esther Cohen as the first honoree; this year, she will be attending her 23rd event as current Sisterhood co-president with her daughter, Robyn Rose! Cost for the dairy brunch is $40 per person; a minimum donation of $18 to Torah Fund is also required. This is an ongoing major project of the Women’s League of United Synagogue of Conservative Judaism, which supports USCJ’s Jewish Theological Seminary locations that train rabbis and educators in New York City, Los Angeles, Jerusalem and Buenos Aires. Every year’s honoree(s) will take charge of the following year’s brunch; this year’s arrangements have been supervised by Debbie Wills, who was recognized in 2015. For further information and to make brunch reservations, please contact Elaine Scharf, Sisterhood Torah Fund chair, by phone, 972-307-3521, or email, ebscharf@verizon.net. For his Eagle Scout project, Asher directed and led a team to build four large wooden mounting blocks for the riders of Equest so they are able to get onto their horses. With the courage and determination to soar like an eagle, Asher Kogutt has spread his own wingspan far and wide, now readying to be awarded the Eagle Scout Medal and honor. With the courage and determination to soar like his upcoming award’s namesake, Asher Kogutt spread his own wingspan far and wide to achieve the rank of Eagle Scout. Asher, who lives with special needs, has been a Boy Scout since he was just 6 years old, has completed his Eagle Scout project and is in the midst of earning his last merit badge — gardening. Once complete, Asher will go before the Eagle Board of Review — and be so honored. “Boy Scouts is fun and I like the camping and being outside and sleeping in tents,” said Asher, the son of Judy and Jeff and brother to Benjamin and Elan. He follows his father and brothers in his quest to become an Eagle Scout; all three have accomplished and respected scouting histories. 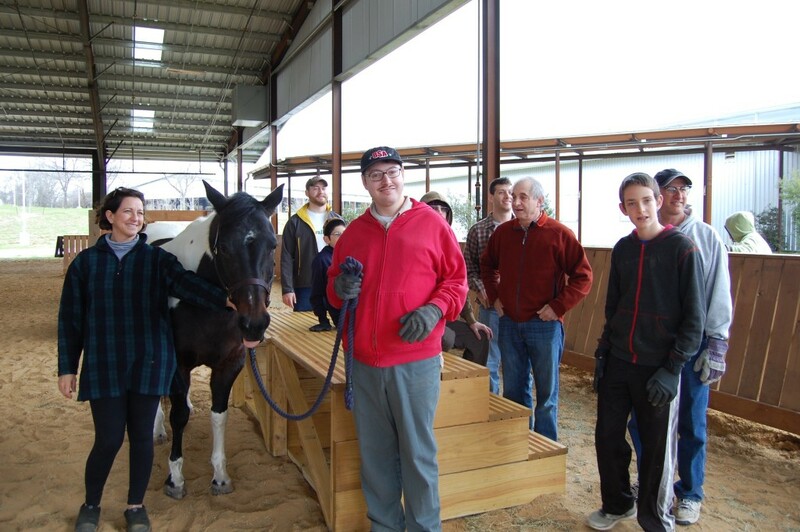 For his Eagle Scout project, Asher directed and led a team in building four large wooden mounting blocks for riders at Equest, where he was a client from age 5 to 13. The blocks facilitate riders getting onto their horses. “Asher really has come full circle, returning as a donor and his gift will help a lot of people for a very long time,” said Lili Kellogg, Interim CEO at Equest. 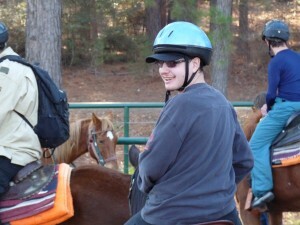 Asher participated in Equest’s therapeutic horse riding programs from the ages of five to 13. Equest, which provides therapeutic horsemanship activities and therapies to children and adults with physical, cognitive, sensory, coping and learning disabilities, has locations at the Wylie Center in Wylie and The Texas Horse Park in Dallas. The latter, which received Asher’s donations, services 200 weekly clients in addition to between 50 and 75 participants in a veteran’s program with one-time experiential opportunities — a “horsemanship 101” — and many others through community outreach events with schools and other groups. “Asher really has come full circle, returning as a donor in this manner, and his gift will help a lot of people for a very long time,” said Kellogg. She noted that the mounting blocks will be used for clients in veteran programs, physical and occupational therapy, equine facilitated counseling, therapeutic carriage driving, therapeutic sports riding and competition. Troop 263, a troop for special needs members, is a part of Circle Ten Council of the Boy Scouts of America. Boys or men can join this troop as young as 11 years old and into adulthood, and remain scouts indefinitely. Troop 263 has 18 members and hosts weekly meetings at the Bachman Recreation Center, monthly outings, four campouts each year and a summer camp program. “I’m so honored to be here with and for Asher — it’s quite an effort and I’m so impressed with his abilities and drive to move forward,” said Ben Burns, Asher’s scoutmaster. “He’s created a great project and worked so very hard. A CHAI (Community Homes for Adults, Inc.) resident, Asher is a member of the Maccabees Special Olympics basketball team and, as a Dallas Yachad (National Jewish Council for Disabilities) member, he recently went on a Birthright trip, his first time to Israel. Asher is a graduate of DISD’s Special Needs Transition Program, an Honorary AkibaKid and Yavneh Bulldog, and former Habima Theatre and Points 4 Peace Basketball Tournament Special Event participant. There are few areas of the Jewish community where he hasn’t left his mark. Words that describe Asher Kogutt, who ranks up among the best and most proud — one to always be prepared! Anyone interested in joining Troop 263 can email benburns2010@yahoo.com. Is the world safer today? Not to mention the fact that Iran now has a clear pathway to developing and stockpiling nuclear weapons within a few short years … or much less if they cheat. Are Sunni Saudi Arabia and Shiite Iran on the brink of war? The execution of Saudi Shiite cleric Nimr al-Baqer al-Nimr and the subsequent attacks of Iranian rioters on the Saudi embassy in Tehran, and consulate in Mashhad, caused unprecedented damage to the relations between the two countries. Saudi Arabia cut off all diplomatic relations with Iran, together with other Arab-Muslim countries including Bahrain, Sudan, Somalia, Djibouti and the Comoro Islands. The UAE lowered the status of its diplomatic relations and the governments of Qatar and Kuwait recalled their ambassadors for consultation. Jordan joined the protest against Iran, but retained diplomatic relations. Iran threatened revenge and warned that the end of the Saudi regime was close. Supreme Leader Ali Khamenei threatened the Saudis with “divine retribution” against the heads of the regime. But is war eminent? It’s possible though most analysts doubt it. One reason is that the Saudis and most Middle East countries believe that because of the watered down conditions of the “Nuke Deal,” Iran is still in the same 2-6 week nuclear “breakout” stage it was this time last year. That’s why Saudi Foreign Minister Adel Al-Jubeir flew to Pakistan last week not only to get assurances that the only Sunni Muslim nuclear country will provide assistance to repel Iranian aggression, but also possibly to get two or three off-the-shelf nukes. Two terrorists stabbed two women Monday (Jan. 25) afternoon at a grocery store in the settlement of Beit Horon in the West Bank. A security guard shot and killed both of the attackers. Security forces found three homemade bombs in the vicinity of the store, apparently planted there by the terrorists, and a bomb squad was called to the scene to neutralize them. The Shin Bet, in cooperation with the IDF, recently arrested 18-year-old Palestinian twin sisters Diana and Nadia Hawilah, following a search of their house that revealed weapons including pipe bombs, fertilizers used for making explosives, as well as a knife and Hamas headbands. … According to the investigation, Diana bought the chemicals found in her home, watched online video tutorials to learn how to build explosive devices, and intended to use them against Israelis. A 13-year-old Palestinian girl tried to stab a civilian security guard at the entrance to the settlement of Anathoth in the West Bank’s Binyamin region Saturday morning. The security guard shot and killed her before she was able to hurt him. There were many more attacks, including a 14-year-old boy who stabbed and killed a mother of six after seeing a program on Palestinian TV, inciting everyone to kill Jews. There are politicians that argue that today the world is a safer place. … As I said above … I’m just not buying it! Sixteen biblical lithographs by Marc Chagall, one of the 20th century’s premier artists, will be exhibited at Beth-El Congregation from Feb. 1 through April 30. Titled Art as Midrash, the three-month show will feature two lectures about the popular artist, whose Jewish-themed works stimulate emotion and analysis. Among the Chagalls hanging in the Beth-El board room is Moses With the Tablets of the Law, a vibrant work filled with hues of scarlet and cobalt. The colorful lithographs, on loan from the Dallas Museum of Biblical Arts, were created by the artist in 1956 to celebrate publication of a set of etchings he was forced to leave behind in France when his family escaped Nazi-occupied Vichy in 1939. The art’s survival and eventual publication seemed a miracle, and the lithographs at Beth-El constitute an homage to Chagall’s personal history and heritage. Born into a Hasidic family in Belarus in 1887, Chagall developed his dreamlike style during his years living in France. Marked by floating objects, upside-down farm animals, shifting planes, and fiddlers-on-the-roof, Chagall’s art filters his childhood memories through a myriad of modern art styles. The Beth-El exhibit’s keynote event, Wednesday, Feb. 10, is co-sponsored with The Jewish Federation of Fort Worth & Tarrant County. It will begin with a wine-and-cheese preview at 6:30 p.m. followed by a 7 p.m. lecture featuring art historian Scott Peck. Peck is director and curator of the Museum of Biblical Arts and curator of a related show at the University of Dallas. He holds a certificate in Jewish ceremonial art from New York’s Jewish Theological Seminary and has curated exhibits in cooperation with the National Holocaust Museum and in partnership with the Israeli government. The second talk highlighting the Chagall show will be during Shabbat services, Friday, March 18. Rabbi Ralph Mecklenburger will deliver a sermon on “Art as Midrash,” exploring how artistic creations add nuance to religious narratives. Jewish and non-Jewish organizations are welcome to schedule their monthly meetings in the board room and to invite art docents Sheryl Levy or Gail Granek, both Beth-El congregants, to lead a discussion about Marc Chagall. (To schedule a meeting in the board room, contact the Temple office at 817-332-7141.) To date, Jewish Women International and the Daytimers are planning programs. The question remains: How was Beth-El able to land a Chagall exhibit, a first in our community? Six months ago, congregant Kim Goldberg, a professional artist, was invited to serve on a Chagall Advisory Committee. It was planning an exhibit at Irving’s University of Dallas about Marc Chagall and the stone-lithograph process. The group wanted to stage satellite events to expose the larger community to the famous artist, who died in 1985 at the age of 97. Kim suggested a corollary exhibit in Tarrant County. Scott Peck offered to loan stone lithographs from his museum’s collection. Kim’s husband, Bob Goldberg, director of our local Jewish Federation, sent an email to eight Tarrant County Jewish institutions explaining the availability of the Chagalls. He received enthusiastic responses from Rabbi Mecklenberger and from Jim and Elaine Stanton, co-chairs of the Beth-El Art Committee, and that got the ball rolling. The Art Committee, which stages quarterly exhibits by local Jewish artists in the Temple board room, had the experience to seamlessly organize, hang, and publicize a Chagall show, replete with a poster created by Beth-El’s Communications Director Alexa Kirk. The concurrent exhibit at the University of Dallas’s Beatrice M. Haggerty Art Gallery is called Marc Chagall: Intersecting Traditions. It runs Feb. 4 to April 22 and features 50 hand-colored etchings from Chagall’s The Bible series. The show will include demonstrations of the stone-lithograph technique, whereby images are traced onto a flat, limestone tablet. One color at a time is added to the composition by the artist. After each application of oil-based paint, high-quality cotton paper is pressed to the stone. Next, the limestone is cleaned, and the artist applies another color, precisely placing the paper in the same spot. So exacting is the process that each application of color takes up to 40 hours. Have a story? Email Sharon Wisch-Ray at sharon@tjpnews.com. The day after tomorrow, my great-nephew Tommy will turn 11. He’s the usual pre-teen boy: energetic, sports-loving, sometimes confounding his parents. But he is also a gentle soul, kind to his younger sister, already a voracious reader and a thoughtful, unusually serious student. I think he inherited this love of learning from two of his grandparents. Their mutual dedication to education, and the desire to share each others cultures, were what drew Ruth and Damu together. He, an honored graduate of the University of Poona, would go on to earn both a master’s degree and doctorate; earlier, she had already accepted the challenge of teaching American history in the very non-academic atmosphere of a vocational high school. When he finished his studies, the two married and moved to New York. Damu had no religious affiliation, always calling himself “a Jewish sympathizer.” But in Ruth’s honor, Dr. Dheckney had arranged for the couple to attend a Jewish wedding in Bombay. My brother-in-law, now retired after many years as a West Point professor, has also authored the most respected, best-used college textbooks in econometrics. From this grandfather, my great-nephew Tommy, one-quarter Indian, has inherited his questioning mind and tenacious pursuit of learning. From my sister, his Grandma Ruth, came this second quarter: the same drive to overcome obstacles that strengthened our beleaguered Eastern European forebears when they chose the difficult journey toward a new start in America. And a full half of Tommy’s legacy was bequeathed by his father’s parents; theirs was the pioneering spirit of the English colonists who in 1664 wrested from the Dutch the land that was to become Delaware, the first of the United States. As an advance 11th birthday present, Tommy received this special date: Jan. 28, 2018. That day, he will become a bar mitzvah. God willing, I’ll be there to kvell with the whole family! Rabbi Yerachmiel D. Fried wrote a beautiful response to a young Jewish family searching for tools to create meaningful Jewish experiences for their child in his Jan. 14 Ask the Rabbi column. In addition to reciting the Shema, sharing books with Jewish themes and concepts is a powerful way to enhance young families’ Jewish bedtime rituals. Children’s books have a real capacity to teach the principles, lessons and traditions that we strive to instill in our sons and daughters. Finding the right books and making the time to read as a family can be challenging and that’s where PJ Library comes in. PJ Library sends free Jewish children’s books to families across the world every month to keep. These books share Jewish stories that help families come together and talk about values, tradition and culture. PJ Library is made possible by the Harold Grinspoon Foundation and, in North Texas, is a gift from the Center for Jewish Education of the Jewish Federation of Greater Dallas through a generous grant from the Mankoff Family Foundation. For more information concerning PJ Library Dallas, please contact Alyse Eisenberg, 214-239-7193, aeisenberg@jfgd.org. COLLEGE STATION — The Jewish community of Aggieland is opening its doors and saying “Howdy” to prospective students from around the state at the fifth annual Aggie Jewish Open House Feb. 12-13, 2016. Jewish high school students of all ages are welcome at this annual open house, which showcases Jewish life at Texas A&M University in College Station. “We’ve combined this year’s Aggie Jewish Open House with Aggieland Saturday, the university’s massive open house, so that students can spend time learning about the Jewish community and about the campus,” said Rabbi Matt Rosenberg, director of Hillel at Texas A&M. Aggie Jewish Open House begins at 6 p.m. Friday, Feb. 12 with candle lighting followed by Friday night services and a delicious Shabbat dinner. On Saturday, Feb. 13, Aggieland Saturday takes place from 9 a.m. to 3 p.m., and later that afternoon discussions about Jewish life and Jewish fraternity and sorority life on campus take place. Students have the opportunity to stay overnight with current students but preregistration is required at AggieJewishOpenHouse.com. For more information, call Hillel at 979-703-1856 or email rabbimatt@tamuhillel.org. Registration is $10 and must be complete by Feb. 7. FORT WORTH — Against the backdrop of a special photo exhibit spotlighting the people of Western Galilee, the steering committee for the Partnership2Gether Peoplehood Platform commenced a two-day conference Sunday morning on the grounds of Beth-El Congregation. In state: Austin, Fort Worth and San Antonio. U.S.: Canton, Dayton, Des Moines, Indianapolis, Louisville, Northwest Indiana, Omaha, South Bend, Toledo, Youngstown. Overseas: Western Galilee (Akko and Matte Asher) and Budapest. The Fort Worth conference officially begins the process of consideration of the organization’s proposed $500,715 budget for 2016-2017. The previous year’s approved budget was $589,550. Judy Yuda, director of partnerships for the Jewish Agency for Israel, was upbeat about the conference on Sunday. The Partnership2Gether platform is a consortium of United States cites that partner with Western Galilee and Akko. It is divided into task forces in the areas of education, medicine, arts, resource development and a partnership with the communities of Budapest and Hungary. Twice a year the steering committee convenes to review past programs and proposed future programs, and to plan budgets for the year, explained Bob Goldberg, executive director of the Jewish Federation of Fort Worth and Tarrant County, which hosted the conference. The photo display was on exhibit in the Great Hall of Beth-El Congregation. The photos were the work of Jan Friedman and Kim Goldberg, who took them on a trip to Western Galilee and Akko. Albert Ben-Shloosh, general director of the Akko Festival and a longtime Partnership2Gether volunteer, said budget consideration is an important task. Incidentally, the Akko Festival, otherwise known as the Akko Festival of Alternative Israeli Theatre, is a four-day performing arts festival held annually in the city of Akko, Israel, during the intermediate days of Sukkot. Dave Ravitch, Partnership2Gether co-chair, said the steering committee will convene in Toledo in July for a “very special” meeting. Ravitch said the budget review process should wrap up around that time. “That’s when we will finish looking at everything and vote,” he said. In a letter to the Partnership2Gether group, Co-Chair Michael Aaronson also emphasized the importance of the budget discussions. Judy Yuda described the Partnership2Gether group as family, with nearly everyone at the conference knowing one another. Yuda added that now is the time for everyone involved in the budget process to tell their story — what they did the previous year and what they want to do the coming year. “These two and a half days we are here are for the most part to define who we are and what we are doing,” she said. In his own letter, Dave Ravitch thanked Bob Goldberg and the Federation for hosting the Fort Worth conference — which included kosher barbecue and a field trip to the Fort Worth Stock Show and Rodeo on Monday.